Lining up as a 3 band, strength in numbers, effort to smuggle interesting narratives into shiny rock music, Retro Video Club and friends have recently found that fully committing to their live shows, and surrounding themselves with likeminded allies, is a surefire way of creating a lasting impression in a live show. Starting up first was Blackwaters who wasted no time in building a sound out of heavy riffs and a bass as equally important as their lead guitar. 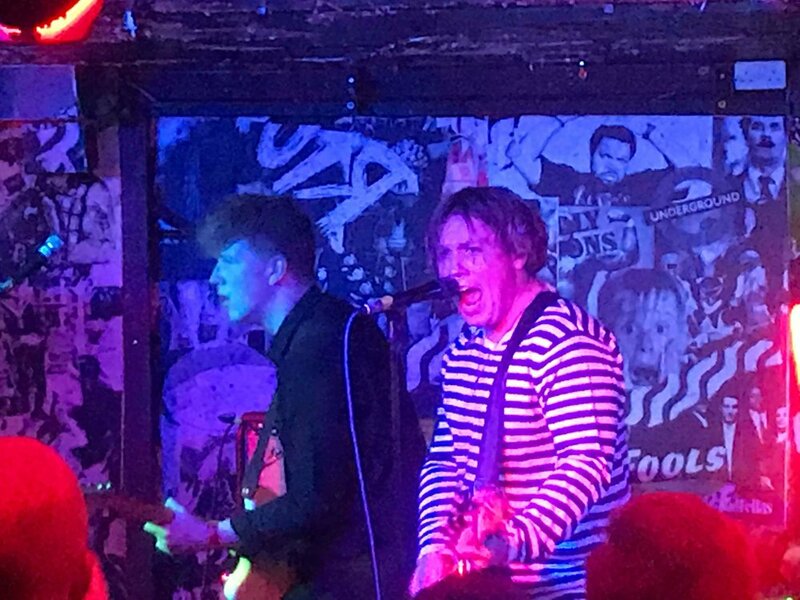 They attacked the stage with powerful vocals and a punk-meets-garage rock feel which captured their desire to shake things up and steal the show from bonfa-fide headliners Red faces and Retro Video Club. Confident and assertive their set was sharp and focused. Rising to the challenge set by the opening act were Red Faces. Themselves a band with a strong reputation as young indie-rock stars, they pitch their sound somewhere between slightly aggressive elements of The Charlatans and more soulful elements of soul, funk, blues moments of The Doors, creating a sound that is equal parts unashamedly nostalgic and undeniably modern. Central to their narratives are Buzzcocks themes of falling in love and being out with your friends, their live style and their songs are deliberately focused, direct and to the point. Headliners Retro Video Club also proved not to be cowed by the prospect of following such strong sets. The band finished the evening with an intimate, up-close, full throttle set focused around a tough indie pop guitar sound. Appreciative of the audience, and confident with their songs, frontman Liam Allison presents back of the throat delivery and honest lyrics in a deliberate attempt to show that the world of the realist does not always end in success and not every attempt is a victory; sentiment wise, we’re not far removed from the glory days of Postcard. Allison’s acoustic solo moment during ‘Noir’ ironically steals tonight’s guitar dominated show with possibly the most gentle moment of the evening, and certainly the most intimate. Choosing to focus on a lover unable to forget past relationships, 'Noir' is a tale about dreams, shattered aspirations, and the courage needed to get back up and start again when the world seems against you. Tonight’s stellar line up all came, all conquered and all contributed to raising the standards of those around them. Competitive yet collaborative, this was a great team effort with the ultimate winner being fans of live music and these bands created the lasting memory they were looking for.